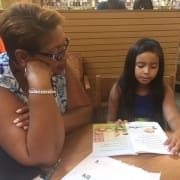 Seeking Mentors for Kids Achieve Club! The role of the mentor is to promote the education of students through reading to children in grades 1-6th and provide homework assistance. The mentor will also encourage, inspire children to do their best, to be confident readers, and that they can achieve academic success. Mentors are not required to be bilingual, however there’s a high need for the following languages: Spanish, Farsi, Dari, Pashto, Arabic, Amharic, French and ASL.